For a few years there, the Interbike national bicycle show week in Las Vegas was always capped off by a cool bicycle ride on the Saturday following the trade show's last day on Friday. The folks at RTC, the local bus and transportation agency, held a Viva Bike Vegas ride that at one time had more than 2,500 riders. But in 2013, the Viva ride lost more than 25 percent of its riders and RTC lost $117,000 on the event. But the Perimeter Association of America folks from Tucson who put on that cool Tour de Tucson stepped up in 2014 and took over the Viva ride. Unfortunately, Perimeter could muster only several hundred riders for its event -- even with Zappos chipping in and helping. So this year, Perimeter pulled out too -- just like the RTC the year before in 2013. 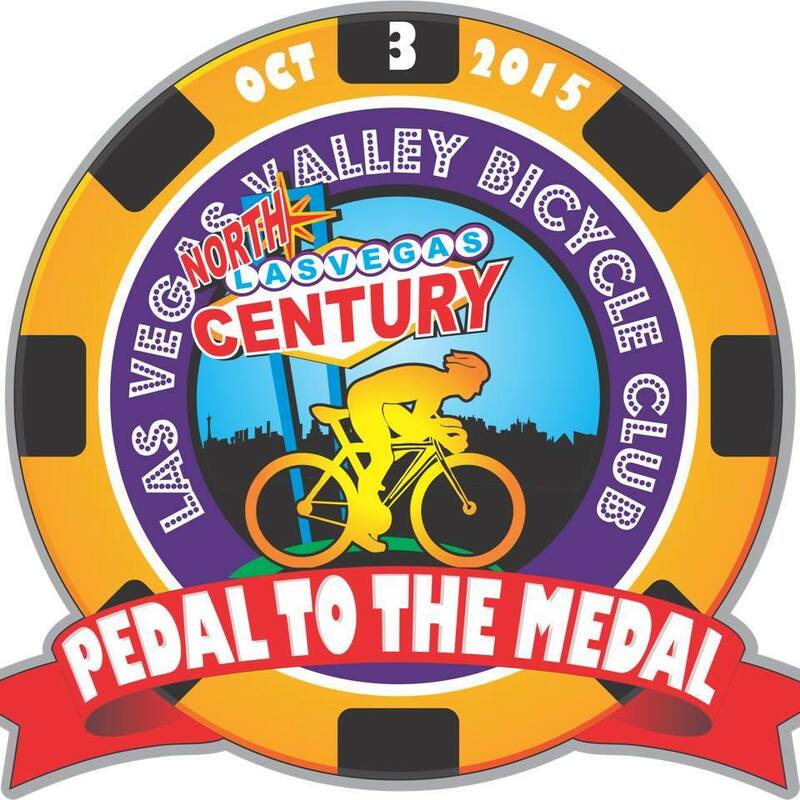 But now, another organization with bicycle ride fund-raising experience has returned to the Las Vegas scene. 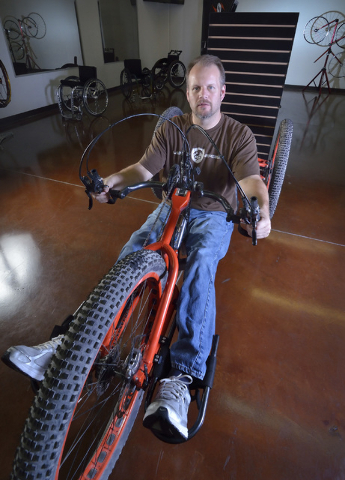 The National Multiple Sclerosis Society is partnering with Interbike for a Sept. 19 ride -- the Saturday after Interbike week ends. Interbike is the presenting sponsor. It's called, Bike MS: Las Vegas, and participants who pay the ride fee and raise a minimum of $100 get to attend Interbike's Customer Appreciation Day for free on Friday, Sept. 18 at the Mandalay Bay Convention Center. The Review-Journal broke the news with this story today. There are two rides -- one is 30 miles and the other is 50 miles. Start time is 7 a.m.
Sign up here to ride the MS event. Few places can match the ocean scenery, gently rolling hills and craft beer possibilities than north San Diego County. I write about them for the Review-Journal's travel section. 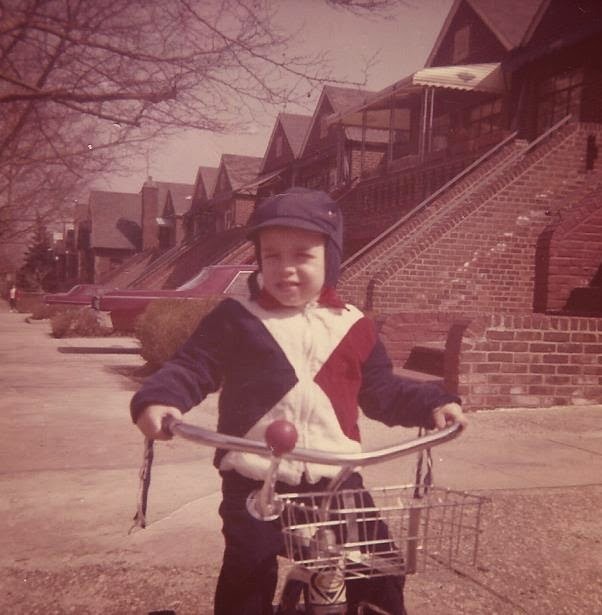 There are some classic bicycle movies -- Breaking Away, Pee-wee's Big Adventure and American Flyers. But here are three well-known movies that are not necessarily known for their bicycles but the bicycle played a huge role in each flick. 1. 40-Year-Old Virgin: Steve Carell uses his bicycle to get to work and crashes one night, to set up the final big scene. 2. 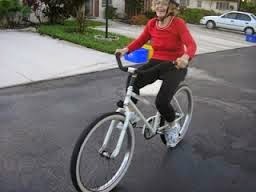 Wizard of Oz: Miss Gulch is on her bicycle when Todo pops out of her basket and runs home. Nothing like a new bicycle ride to see a new side of Las Vegas. For nearly three years, I biked the roadie circuit in Red Rock Canyon, pedaling a nice Specialized Roubaix road bicycle into the Red Rock foothills and feeling the awe and power from those big red stripes on the mountains. 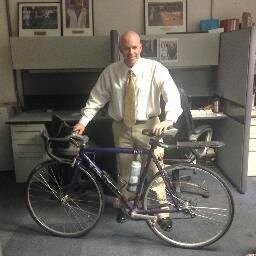 And for jollies, I would bike a steel-framed, single-speed fattie cruiser -- the Surley Pugsley -- for that rolling party on wheels known as the Blinking Man Ride in downtown Las Vegas twice a year. But on Monday night I discovered a third great ride to create the Holy Trinity of Las Vegas bicycling -- the weekly Monday night Smash Brothers ride that rolls out from The Beat coffeehouse on East Fremont in downtown. It featured a stunning array of working man bicyclists from Rich, a white dude with a rolled-up bandana in his waivy hair who was a full-time substitute teacher on a fixie and wearing long purple shorts; Henry, a black guy who lived near Desert Breeze Park, rode a 2002 Trek 1000 (Trek's intro road bike) and worked as a handyman; and Edgar, a Latino in long gray shorts and Vegas Bike Store bicycle jersey while pedaling an upscale Cannondale road bike. There were probably about 60 in all, mostly riding fixie bikes, but lots of roadies and non-Spandex types on old mountain bikes, too. -- Monday. Gets the week off to a flying start and rejuvenates you after the first day of the work week. -- Night. A big crowd of blinking red lights makes safe to ride at night. -- Cross-section of bicycles; Fixies, road, single-speed, mountain bikes -- they were all there. -- East Vegas: Most bicyclists ride the western suburbs, and then the Red Rock Canyon area. This offered a taste and view of the East Vegas grit and working man side of town. -- No bicyclist left behind: Every several miles, we stopped and re-joined up with our fellow bicyclist. You were never alone on this ride. We biked out of downtown to Maryland Parkway, flew down a hill at 30 mph and made a right turn on Washington for a ride through Vegas' working class east side. These weren't the Summerlin roadies or the Blinking Man rolling bike bash folks. It was a different crowd; An unpretentious crowd of bicycle lovers who were rolling together and had each other's back as we pedaled east. It's time for my Hi Five -- five bicycle links that grabbed my attention. 1. Even the Tour de France is not immune from gun shots when Paris police fired at a car that broke through a Tour de France barricade. Police are searching for the four car occupants. 2. God bless those well-intentioned road planners and public works designers, who try and stick bike lanes everywhere. Sometimes, like in this case in Colorado Springs, the bike lane gets a little bit wacky -- and can lead a bicyclist to a potential death. 3. When you're on a bicycle and you're in the middle of nowhere and gotta go, well you gotta go. In this case in Idaho, this bicyclist poop job led to a fiery mess. 4. This country is filled with inspiring stories of overweight people who used a bicycle to change their lives. This fella tips the scales at more than 400 pounds, yet he wanted to bike across the country to change his life. One little problem -- his bike broke down. But a bike shop came through and gave the guy a free bicycle for his trip. 5. 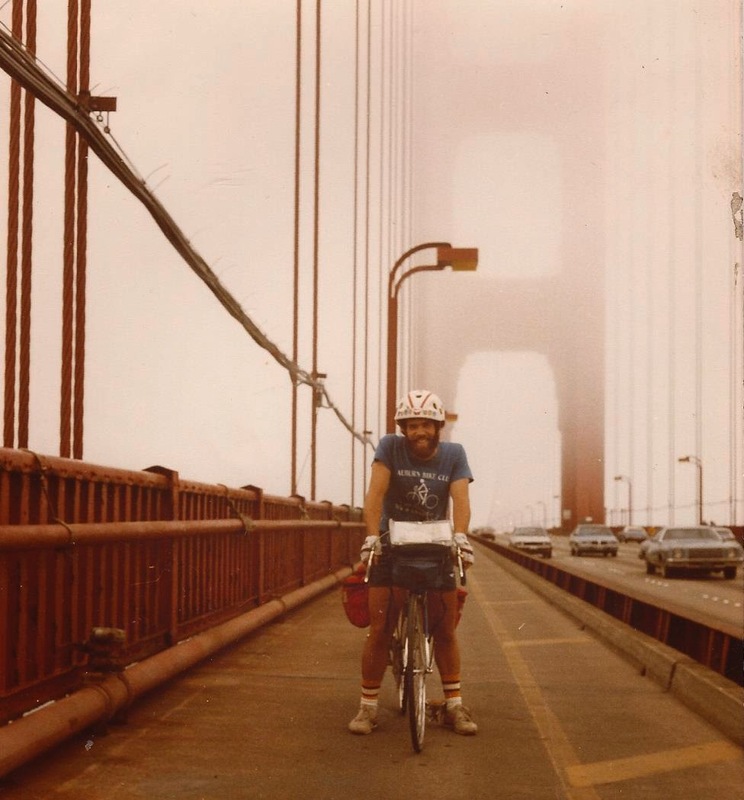 Tragically, bicyclists are killed across the country. In this case, a garbage truck killed a bicyclist. 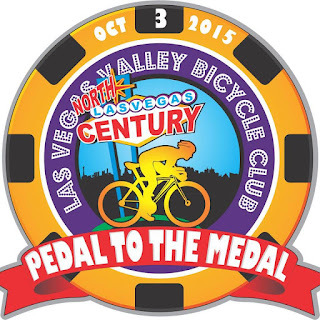 The Pedal to the Medal fund-raiser bicycle ride is back this fall and the Las Vegas Valley Bicycle Club is the ride's host. It's a money maker for great causes -- the Pancreatic Cancer Action Network, Special Olympics Nevada and the Southern Nevada Bicycle Coalition. It's Oct. 3, a time of year when the weather gets super nice and there's a variety of distance rides to choose from. The city of North Las Vegas is involved and the start and finish will be at Craig Ranch Regional Park. Plus, there's a children's bicycle rodeo and great raffle prizes like one girl's bicycle and one's boy bike. On Sunday morning, I drove to the Spring Mountains visitors center, which is around 6,500 feet in Kyle Canyon. Then it was off to the Las Vegas ski center, 14 miles away and more than 2,000 feet of climbing. But the views -- it's worth the grind up on State Road 157. Peak on 157 was 8,437 feet. When I finally reached the ski center, I joined some motorcyclists. And then they came -- a bunch of Porsche motorists who felt entitled to take over the entire end of the road because I guess they're special for owning Porsches. Then it was back to 157 for the ride to the visitors center on Kyle Canyon Road. And back at the visitors center. Total elevation gain -- 3,470 feet. I flirted with driving to Big Bear outside LA for a bicycle ride an expo, but ended up falling back asleep at 6 a.m. and launched my own 41-mile bicycle ride from Summerlin to the Strip, UNLV, downtown Vegas and the RJ before taking the Alta Blvd express back up the 1,100-foot hill back to Summerlin. On the Strip, I checked in on the arena that is called simply, "Las Vegas Arena." I have been covering this story for the Review Journal. Most people see the arena coming to life from the Tropicana Ave ramp of I-15 but here's a shot of the front of the arena from the Monte Carlo side. MGM Resorts International, which owns the casinos on the south end of the strip such as Mandalay Bay, Excalibur, Monte Carlo, Luxor, MGM Grand and Aria, is also building the arena with Anschutz Entertainment Group. MGM Resorts is building a park plaza that will lead from the Strip to the arena. Here's a shot of the first trees installed in that plaza. It'll be along the north side of New York-New York and you enter the park next to Shake Shack. Here's a look at the park plaza looking east toward the Strip. Here's a shot showing how close the arena is to the New York-New York parking garage. The good news is that a one-way road is now open from the Strip west to Monte Carlo and you can see how the Monte Carlo parking garage will also be crucial to serve the arena. I met two drunk women on Las Vegas Blvd at the entrance of the road off the road. One told me not to drink and drive and I told her not to drink and walk. Then it off for a ride down Harmon to UNLV, a quick trip down Maryland Parkway to downtown Las Vegas and Fremont Street, and a peddle over to the RJ for a bathroom stop and a water bottle refill. On my way back up Alta Drive, I met an old face -- not Locher, former Review-Journal photographer now shooting for the AP out of Vegas. John bought a new Cannondale and it was good to see him pedaling up Alta. We biked to Buffalo where John turned around. And as soon as John left, there were about 15 cyclists coming up Alta -- the Las Vegas Valley Bicycle Club. I met Kristine M,, a Channel 3 news producer who was cycling and sweeping the ride. A group stopped under the cloak of shadeness to wait for other riders to catch up. And then there was the old left turn from Alta to Hulapai. The group was only a mile from the start-end point at a Starbucks off Charleston in Summerlin. I rode a few extra mile to complete the 41-miler. It was getting downright toasty at the end. Man, it's a tough ride up the bumpy rocky trail to Little Red Rocks. It's a single speed with no shock fork, but there's something satisfying about muscling that steel chariot up into the high desert into Little Red Rocks. The light is wonderful once the sun drops below the Spring Mountains. 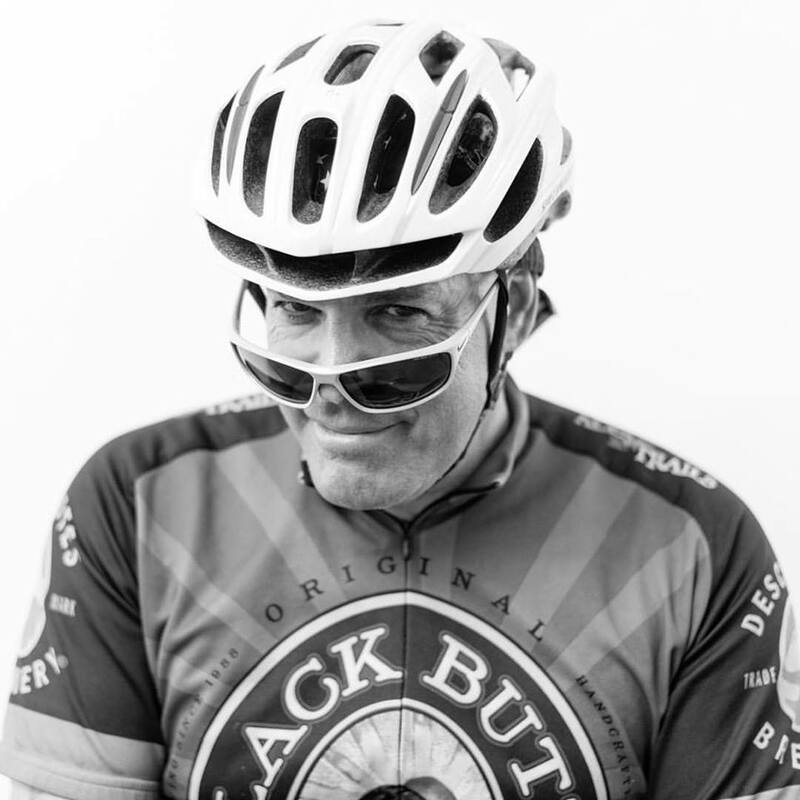 Damien Patton is a bicycle-riding CEO of a company called Banjo that has bases in Las Vegas (in the Switch center) and in Silicon Valley near Palo Alto. Banjo is creating a tech "crystal ball" that will analyze social media posts, pictures and videos to identify news trends and themes. The company already has more than 30 clients, such as Budweiser and ABC News. 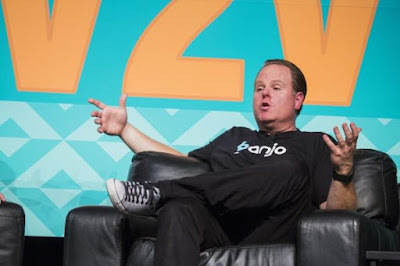 I wrote an RJ story on Patton being the keynote speaker for the South by Southwest V2V startup conference at the Bellagio this week. Patton bikes from his home in the Highlands area in south valley to Red Rock Canyon, enjoying the scenic drive at the BLM loop. He's cycling a Specialized S-Works he bought from Las Vegas Cyclery and he keeps a Roubaix at the Redwood City, Calif. office. I chatted with Damien after his speech about bicycling and he said he comes up with his ideas while cycling because the distractions melt away and it's a great stress-reliever. This is a very well done column in the Portland, Maine newspaper explaining the concept of bicyclists properly riding in the traffic lane. On Sunday morning, the temps dropped down to 68 degrees when I began cycling in Summerlin and up 159 to the Red Rock Loop. Once on the Loop, the temps barely nudged above 70 degrees, and even though it was more humid than normal, it was delightful on this drive. Even at vicious Mile 2, when the steepness usually causes many a cyclist to rise out of his seat and grind up the steep-graded hill. The uphill ride to the overlook was worth it after I took a few healthy gulps of water and snapped a few shots of this. I'm grateful I call this the back yard. I love that our local governments buy bicycle helmets and get volunteers to distribute them and fit them on the heads of cute tykes. 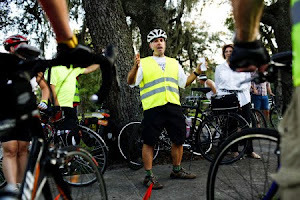 It happens across America, especially in places that suffer from a cluster of fatalities that involve motorists killing bicyclists. Like here in the Las Vegas valley, where a whole bunch of car drivers have struck bicyclists and people who have been killed or seriously injured lately. 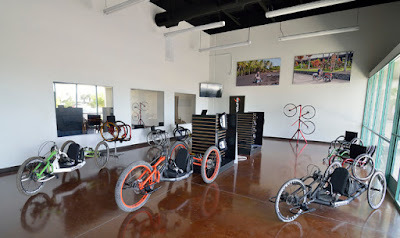 The Nevada Department of Transportation provided 3,000 helmets and the Southern Nevada Bicycle Coalition, a group of nice bicycle folks promoting bicycling in the Las Vegas area, and the RTC helped give them to kids. In fact, they ran out of free helmets at Villa Pizza in Las Vegas and were hoping for a quick delivery of 60 more when I was there this morning. That was just one of several locations where the bike helmets were given to kids. But the fact is the root cause of many cars-vs-bicycle crashes are motorists driving too fast, not focusing on the bicyclists in the road, talking/texting on cell phones and using just all-around dumb judgement. I'd like to see the Nevada DOT do more campaigns on getting motorists to clean up their acts in addition to handing out the free helmets and reflectors. Before the rains come today to the Las Vegas valley, trusted bicycle sidekick Kevin Cannon and I pedaled from Summerlin to Blue Diamond and back this morning. We stopped at the State Road 159 overlook in Red Rock Canyon and wondered if anyone has ever used this lonely bicycle rack. I have never seen this bike rack used. Man, I wanted to just stay in bed this morning before heading to work. But I rallied. I threw myself out of bed, threw on a jersey and cycling shorts and began pedaling before I could convince myself to do otherwise. And I'm sure happy I did. It was about 85 degrees on the Red Rock scenic loop this morning. The drive's official high point is actually not the overlook before the 5 mile mark, but a gentle curve right after the overlook lot at 4,771 feet. Moral of the story: The hardest part of the bike ride is the first pedal stroke. The bicycle always gives you back more than what you give it. Finally. some bone-chilling sub-70 degree temps this morning in the dip on Sr 159 between the Red Rock scenic drive entrance and exit. Some mornings, we did not even get below 90 degrees in the Las Vegas area. 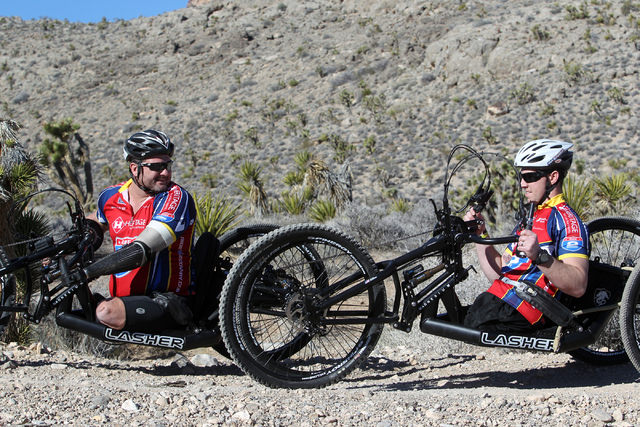 Inspiring business -- Lasher Sport, which manufactures the country's only full-suspension, hand-driven, off-road hand cycle. For you bicycle fans out there, you will notice the downtube shifters, which give away the age of this Cannondale R300 aluminum-framed road bicycle. It's a 1995 Cannondale that was bought at a bike shop in Stuart, Fla., used for only a few years, sold to a brother-in-law, stored in a shed outside Baltimore for 15 years or so and re-claimed by me nearly two years ago. It returned to me in Las Vegas and I replaced just about every feature on the bicycle -- except for the original drive train. Derailleurs, chain, rings and crank arms are original. The small upfront ring is not so small, so it was a grind climbing the Red Rock scenic loop with my fellow New York buddy and bike pal Scott. Here's Scott in action here. He has a Cannondale, too -- a 2010 version. It was fun to bike slower and take one or two more breaks than usual as I pedaled the 20-year-old Cannondale. It doesn't have the handling ability of my more recent Specialized Roubaix, but it was great to take the ol' wheels out there. No matter what bicycle you pedal, the scenery is always grand. Happy Fourth of July from Bicycle Stories. To me, Independence Day is spelled out pretty easily in three little words. It's right there in the intro of our nation's Constitution, our country's blueprint. I realize people will be referring to freedoms and liberties today. But I adore those three little words. And what a we our nation has become. Our nation's founders had the outrageous audacity to create a country where now the heritage, religious, racial backgrounds of our collective we are the most diverse of any nation on earth. It takes a lot of balls to create a country where people with so many different backgrounds are jumbled together. Nobody tried that one before. Sure, our we have our conflicts. What family doesn't? But today, I celebrate America by celebrating its essence traced back to the we of the preamble of the U.S. Constitution -- its beautiful spectrum of diverse people living under a single flag. I dragged myself out of the Summerlin apartment at 6:40 a.m., headed out to Red Rock Canyon and met two cyclists as we entered the BLM Red Rock scenic drive. I met Chris and Mike at the BLM Red Rock booth. The administration there has become very vigilant in checking out park passes and IDs, with a video camera recently mounted on the main booth aimed at the transaction point. Chris zoomed up the first five miles to the overlook at 4,771 feet. But Mike and I chatted as we grinded out the 1,100 feet from the park entrance to the overlook. Mike and I chatted about the local bicycle scene. It was cool to hear that Mike was at the fat tire festival put on by Jared Fisher and Las Vegas Cyclery at the Grand Canyon North Rim two weeks ago Here's Mike and Chris sitting at the overlook, while another bicyclist joined us. After the overlook, it was mostly downhill back to SR 159. The Big Stripe. Do you see the bicyclists.